MISS NATASHA ENQUIST: ELECTRO-ACCORDION CHANTEUSE: Online fun! I have a lot of fun with my Facebook photo album called "Accordingly Accordion", featuring lots of weird, interesting, and funny accordion pictures. My "Squeeze Me - Accordion Chic Apparel" Online Etsy Shop is now in working order. I encourage you to visit it and visit it often. A selective assortment of goods are on there at the moment, more to come of course! A couple important dates to report! May 3rd Mario Pedone - Accordion Virtuoso, will be performing at the Victoria Edelweiss Club, 108 Niagara St at 3:30pm. Admission $15. May 6th is WORLD ACCORDION DAY! 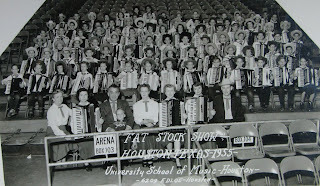 The month of JUNE is Accordion Awareness month, there will be more posting as June approaches.